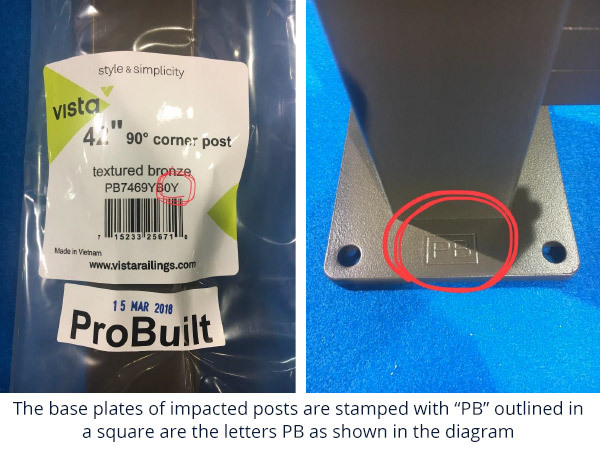 Certain of the ProBuilt aluminum posts manufactured between January 2017 and March 2018 have an issue with the screws that affix the base plate to the post. As a result, the affected posts do not fully comply with local building codes and therefore may pose a fall hazard. Canadian National building codes asks for the individual posts in guardrail systems to be able to withstand a concentrated side load pressure of 224.806 lbs (1 KN). On top of this base load is an added safety factor of 1.5 times (337.21 lbs) and then an additional resistance factor, dividing by 0.90, totalling 374.68 lbs with both safety factors included. The affected posts in question tested to 335 lbs in an independent laboratory testing which is equivalent to the base load of 224.806 lbs plus a further safety factory of 1.49 times. As noted, this concentrated load is applied to a single post. Typical deck railing applications have corners and runs of railing which significantly strengthen to the overall installation railing installation. However, out of an abundance of caution we have provided notice of this issue and are offering potential fixes for those that choose to fix their installed posts. Please note that corner posts (90 degree corners on decks as well as 90 degree corners at the top or bottom of stairs) do not require a fix, even if they fall within the affected identifiers. How do I know if I have Affected Posts? Check the list of affected posts below and search by item codes. ProBuilt™ aluminum railing posts with the following item codes, all of which end in a "Y", are included in the voluntary recall. Only posts purchased between January 2017 and March 2018 with the specific identifying stamp, as shown in the diagram below, are impacted. If you have identified your posts as affected posts, you may choose between one of two Professionally Engineered fix options to consider. Both of these potential fixes are professionally engineered to meet National Building Code. In either option, a kit with instructions and the outlined materials would be sent to you. The Replacement Screw Fix kit will contain 4 replacement screws per post. These new screws would replace the existing screws that affix the base plate to the post. The Gusset Fix kit will contain 2 gusset packages along with tech screws and base plate cover per post. If you choose to proceed with a post fix, please follow this link to fill out the required information. Post Fix cannot be ordered via phone. Common questions and answers to affected posts and post fixes. Do I need to change my posts? First, you need to identify whether or not your posts are affected. The two primary identifiers for affected posts are: a) Did you purchase your posts between January 2017 and June 2018? If no, they are not affected. If yes, check the posts to see if they have a PB outlined with a square stamped into the post base plate (see photo example under the Affected Products section of this website). If your posts contain no PB, or no square around the PB, they are not affected. If identified as affected posts then continue to read through the available information provide here. Note, even affected posts have tested well in excess of the service load factor of 224.806 lbs plus an additional safety factor of 1.49 times on top of the service load. If I choose a post fix what will this do for my post or railing system strength? If I choose the Replacement Screw Fix, what will I receive? 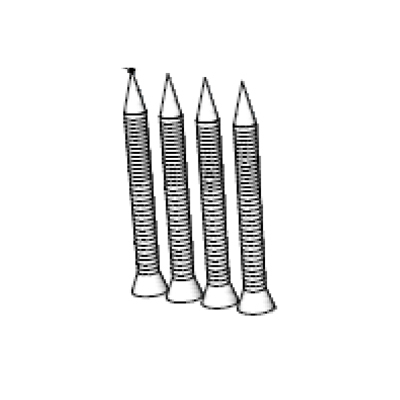 You will receive 4 base plate replacement screws for each non-corner post (not required for 90-degree corner posts). If I choose the Gusset Fix, what will I receive? You will receive a gusset fix kit for each non-corner post (not required for 90-degree corner posts). Each gusset fix kit includes 2 colour-matched aluminum gussets (~7”), 4 self-tapping screws and a base plate cover. Why do 90-degree corner posts (deck or stair) not require any potential fix? Professional engineering analysis shows that the adjacent posts and rails provide significant additional strength to the overall railing systems and in particular the 90-degree corner posts. 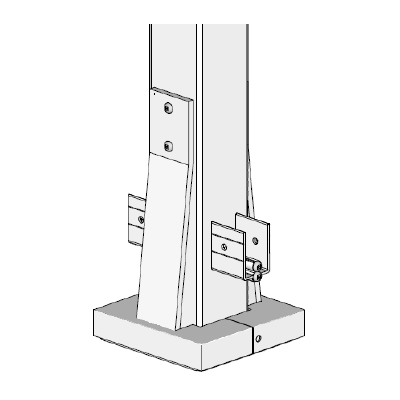 Therefore, 90-degree corner posts do not require any potential fix or action per the Engineering report. A copy of the Engineering Report is available here Replacement Screw Canadian Engineering Report, Gusset Fix Canadian Engineering Report.